We all want better tracking, don't we? It helps us kick out what works and refine on what does work, it helps us justify marketing spend and of course measure our performance. As powerful as digital marketing tools have become a gremlin or 2 or 3 can easily slip into the system and run amuck. Sitting for hours going through reports and trying to bug fix your tracking tags can be a real pain. If you've used Adwords conversion tracking in the past you'll know it doesn't always fire at your will and can cause major discrepancies between your paid search conversion data when you start comparing AdWords with Google analytics. This can cause major issues when accounts become larger and you need to validate every cent you spend and work out the most accurate ROI. Thankfully, Google has seen the error of their ways and has introduced a pre-build conversion linker tag into Google Tag Manager to help solve the problem. What exactly does conversion linker do? When people click on your ads, the URL of the landing page on your website typically includes information about the ad click this could be done via UTM or GCLID URL parameters. When a site visitor takes an action that you’ve tagged as a conversion (e.g. by firing an AdWords conversion tracking tag), the ad click information is used to associate that conversion with the ad click that brought the visitor to your site. The Conversion Linker tag automatically detects the ad click information in your landing page URLs, and stores this information in first-party cookies on your domain. Why is conversion linker an improvement? Storing the data in a separate first-party cookie helps to ensure that you can effectively measure all of your conversions. Conversion linker cookie tracks the user regardless of the browser that your site visitor is using and it is highly recommended that you should deploy a conversion Linker tag on any page where a site visitor may land after clicking an ad. This will help improve ad traffic and conversion attribution. How to set up conversion linker tag? For most cases, adding the tag with the basic setup configuration will be sufficient, but if you require added customisation there are advanced configurations available. I've only just stumbled upon this latest gem from Google and installed it on a few accounts we manage. We'll provide you with an update on this as we accumulate data, let's hope it improves our tracking and attribution. 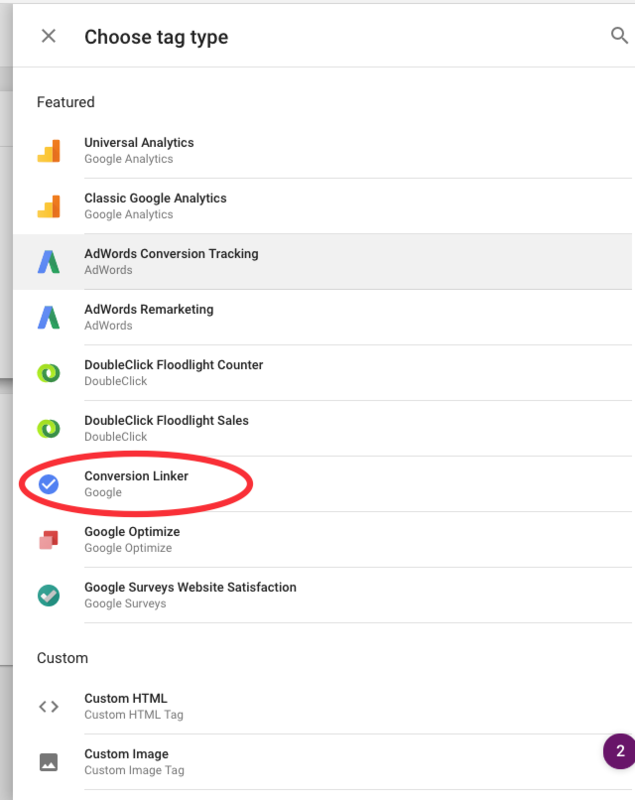 If you have any experience with AdWords conversion tracking let us know what you think of conversion linker in the comments section below.